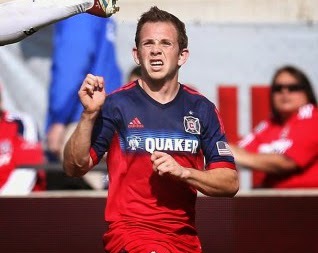 Chicago Fire midfielder Harry Shipp garnered some well-deserved praise following his team's 5-4 victory against the New York Red Bulls on May 10. The rookie and homegrown player tallied his first three Major League Soccer goals and he assisted the game-winner to also earn MLS Player of the Week. Shipp is not the biggest or fastest player on the pitch, but his technical savvy and comfort with the ball more than make up for that. For the former Development Academy player for the Fire and Chicago Magic PSG (Chicago Magic AS Monaco during Shipp's tenure), these elements of the game truly shone at an early age. "I would travel with a bunch of guys for an hour or hour and a half each way to play for the Magic and Fire," said Shipp, who hails from Lake Forest, Illinois, north of Chicago. "Those four or five times a week when we trained were important. They were competitive sessions, and for me, the technical work was incredibly important. I'm not a big or fast guy, and I was really able to get good with the ball." For my full conversation with Harry Shipp, visit ussoccer.com.